This entry was posted in What's New and tagged blue filterin lenses, blue guard, blue light defense, Dr Michael Lange, ophthalmic blue guard, opthalmic blue guard on February 21, 2015 by Dr. Lange. Dr Michael Lange is one of the first doctors in the country to use DNA testing to develop a nutritional protocol for the patients with macular degeneration. Macula Risk® PGx is a combined prognostic and pharmacogenetic DNA test designed to determine a patient’s risk of progression to advanced Age-related Macular Degeneration (AMD) and aid in the selection of appropriate eye vitamin formulations for AMD based on his or her individual genetic risk profile. Dr Lange has utilized this DNA testing clinically to help in the development of a line of nutritional supplements for Macular Degeneration . Fortifeye Vitamins and Dr Lange have developed a line of Genotype directed supplements for macular degeneration. All of the doctors at Lange Eye Care utilize the DNA tests to help them determine which Fortifeye Vitamin supplement will be best for their patients. Once a patient is recommended a supplement based on age, weight, disease level and DNA they have a much higher chance of stabilizing and sometimes even improving. Patients come for all over the country to The Lange Eye Institute in The Villages to see if they may be helped through DNA directed nutrition. Come to one of the many Lange Eye Care locations to see if you are a candidate for DNA testing for macular degneration. This entry was posted in Articles, What's New and tagged dna directed nutrition, dna testing to develop nutritional protocol, Dr Michael Lange, genotype directed supplements, lange ey care, lange eye institute, macular risk on November 8, 2014 by Dr. Lange. Lange Eye Care is fullly EMR now. Lange Eye care is now fully EMR ( electronic medical records) in all ten locations. Dr. Michael Lange and his team researched EMR technology for two years and picked what system they think is best for their patients. This enables a paperless office and allows the optometrists, ophthalmologists, opticians, and the entire staff from the billing department to the labs to all be coordinated together. This will also enable the doctors to communicate with each other and the patients primary care physician more easily. The bottom line is this new EMR technology will improve customer service and allow for the doctors and satff to have much better communication with insurance companies, labs, pharmacies and other doctors. Ultimate goal is to continously stay abreast of the changing times and do whats best for our patients. This entry was posted in What's New on July 20, 2014 by Dr. Lange. This entry was posted in What's New on June 5, 2014 by Acceleration. This entry was posted in What's New and tagged Truclear progressive lens on April 6, 2014 by Dr. Lange. Dr Michael Lange optometrist offering Great Contact lens and Frame specials at Lange Eye Care till March1 2014. This entry was posted in What's New on December 23, 2013 by Dr. Lange. Lange Eye Care is using the Optos Daytona, the newest technology for ultra-widefield retinal imaging. This entry was posted in What's New on September 10, 2013 by Acceleration. 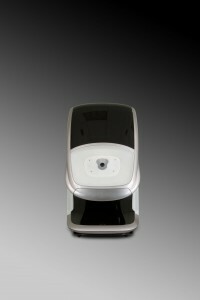 Lange Eye Care and Associates announces the addition of the Diopsys® NOVA-VEP Vision Testing System to their practice. The new vision testing system helps eye care professionals detect vision defects, including glaucoma and other neuro-visual disorders. The Diopsys® NOVA-VEP Vision Testing System is a painless, non-invasive vision test that objectively measures the function of the entireDiopsys® NOVA-VEP Vision Assessment visual pathway from the eyes to the visual center of the brain. The Diopsys® NOVA device does this by using a technology called Visual Evoked Potential (VEP). VEP has been demonstrated to aid in the diagnosis and treatment of many disorders including amblyopia, brain injury, stroke, glaucoma, multiple sclerosis, and other vision-related issues. The purpose of this series of tests is to provide comprehensive diagnostic information to better plan your treatment and monitor the results. Visual evoked potential (VEP) directly measures the electrical activity in the vision system. When light from an image enters our eye, it is converted into electricity at the retina and travels through the optic nerve and other pathways to the part of our brain that processes vision, the visual cortex. brain – visual cortes. We will be measuring your visual cortex and how fast it gets there. The VEP technology in the Diopsys® NOVA device helps us determine how your eyes communicate with your brain in a way that no other instrument or vision test can. By using Visual Evoked Potential technology, we can measure the entire vision system, from the front of the eye to the visual cortex of the brain, without the patient having to say a word. It is best for hair to be clean, dry and free of any gels, sprays or oils as three sensory pads will be placed on your head. For young children it may be helpful to bring a favorite item such as a blanket, pacifier, or toy to make them feel more comfortable during the test. After positioning three sensory pads on the head, a technician starts the test. You will see a series of black and white patterns that appear to “flip” quickly over and over again on a computer screen. It is simply a matter of looking at the pattern for 10 to 60 seconds for each recording. The entire testing time will vary depending on the tests the doctor has ordered. The technician may also choose to patch one eye at a time to record each eye’s response independently. The doctor will review the profile of your eye-brain signals to help diagnose visual pathway disorders as well as to help determine how your treatment is progressing. Should you have any questions about the Diopsys® NOVA-VEP Vision Testing System, or would like to make an appointment, please contact one of the Doctors at Lange Eye Care and Associates. This entry was posted in What's New on August 26, 2013 by Acceleration.